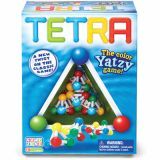 A color Yatzy game. Roll the Tetras to create combinations – 5-of-a-kind; Full House; Double 4's; even 7-of-a-kind! Players have 3 tries to succeed. It takes luck and a bit of strategic planning to earn the highest score. A twist on a favorite classic, Tetra is sure to be a crowd pleaser! For 2-6 players. Contents: 8 Tetras, score pad, game rules. Ages 6+.